About Fabrica de pasta italiana ubicada en Les Rambles de Barcelona, fundada en 1820. La fachada actual es de estilo Modernista y posterior a su fundacion. 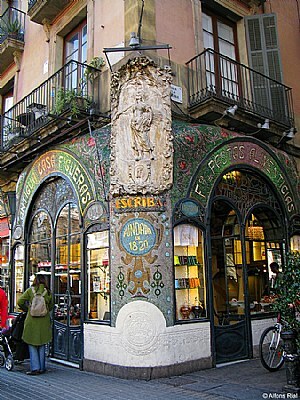 Italian pasta factory located at Ramblas in Barcelona, ​​founded in 1820. The current facade is Modernist style and post your foundation. A very colorful shot of a place that has been around for a long time. Jan, I visited your work and I liked it. It is really excellent. Por cierto Jan, he visitado tu trabajo y me ha gustado mucho. Es realmente excelente. This link will give more information. I sure remember where it is. Greetings. This is so nice, but I can not remember it at the Ramblas in 1978 when I studied a short time there.